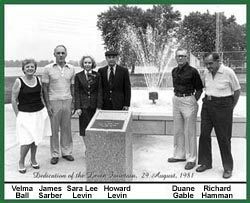 In 1985, the idea -- the dream of one person, Saralee Levin, -- of creating a special garden in the community of Warsaw began to take shape. The history of the site, however, goes back farther than 1985. The area was simply open park land until the mid-1980's, when Mrs. Levin visited the Cathedral of St. John the Divine in NYC, and several other gardens. With our area's religious history in mind, Mrs. Levin decided to use the area for a Biblical Gardens, rather than allow the area to be paved. But why a Biblical Garden, you ask? Mainly because our area, the Warsaw/Winona Lake area of Indiana, has a long religious history. That history begins, perhaps with the Chatauqua times of Winona Lake, now being revived. Many other famous historical religious figures made their homes here, from Homer Rodeheaver to Fanny Crosby to Billy Sunday. But it would be no ordinary garden -- not a rock garden, nor a rose garden, nor a perennial garden -- it would be a truly unique and beautiful Biblical Garden. Actually, we say "gardens" because the Warsaw Biblical Gardens has a variety of areas: the Forest, Brook, Meadow, Desert, Crop and Herb gardens; the Grape Arbor; and the Gathering site. Warsaw Biblical Gardens is 3/4-acre in size, and there are very few gardens like this in the United States. The term "biblical" refers mainly to the fact that the plants, trees, flowers, herbs, etc., are mentioned in the Old and/or New Testaments of the Bible. These have been carefully researched to preserve the integrity of the Gardens' uniqueness. In 1986 the project idea was brought before the Board of Directors of the Warsaw Community Development Corporation (WCDC), an Indiana not-for-profit 501 (c)3 corporation, which functions under the Main Street guidelines of National Historic Preservation. WCDC accepted the project, construction began in August 1989, and the Gardens officially opened on June 23, 1991. Costing over $660,000 to build, the Warsaw Biblical Gardens has been developed entirely with private donations from individuals, local businesses, corporations, and area foundations.